Quinnipiac women’s soccer assistant coach Steve Coxon has a stature and character that belongs on your television screen in an English Premier League match with the likes of Wayne Rooney. 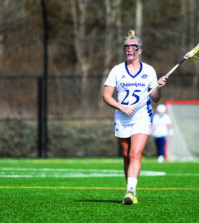 Coxon commands the pitch on the sidelines for Quinnipiac. He can be seen striding up and down the bench on game days making sure each of his players are ready to give their all. Coxon hails from Newcastle, England, a city famously known for its soccer pride. Coxon experienced high levels of soccer at a young age, even playing for Newcastle’s junior program with one of England’s greatest soccer players, Paul “Gazza” Gascoigne. But the life of a professional soccer player, at least in his homeland, was not the path Coxon chose. He had multiple stints as a professional player, ultimately finding his passion in the form of coaching the sport he had played since he was 3 years old. Coxon, who his players affectionately call “Stevie,” said all he has done for the game of soccer is all due to his “relentless” nature. His efforts earned himself an induction into the Connecticut Soccer Hall of Fame, establishing a 200-team youth soccer club, known as the Connecticut Football Club, that includes two indoor field complexes, and last but not least, coaching on the sidelines for Quinnipiac since 2005. As a coach, Coxon constantly tries to personify positivity to his players. Senior forward Nadya Gill says that his approach is to bring positivity to the locker room. The experiment involves a procedure of setting two bowls of rice next to each other, and labeling the first bowl with the word “love” and the second with the word “hate”. The next step requires speaking to each respective bowl with positive and loving words to the first bowl, and negative and hateful words to the second bowl. The result of the experiment ends after a few weeks of repeatedly speaking to the bowls of rice. What follows is that the bowl labeled “love” remains a healthy white color, as it originally was, while the bowl labeled “hate” becomes darker as it yields to fungi and bacteria. Scientific integrity aside, the intended meaning from the experiment is a lesson of the resiliency of positivity. For Coxon, this is not only a lesson for the soccer field, but also a moral compass for life. The word, “relentless” keeps coming up, that is no coincidence. In fact, relentlessness truly characterizes the impact Stevie has been able to make upon the players and those around him. Coxon has now been with the Bobcats for 12 years, and in a way, he is a living embodiment of Quinnipiac. Just as Quinnipiac students and professors are constantly striving forward, so is Coxon. “I’ve always felt that [Quinnipiac] has been on the up-swing, all the time since I’ve been here…it’s never been stagnant,” Coxon said. It is no surprise then that Coxon’s own journey from Newcastle to Connecticut is a story of that relentless drive to never giving up. In 1987, an 18-year-old Coxon received a full scholarship offer from Central Connecticut State University (CCSU) to play soccer. He took the offer and made his way to across the Atlantic Ocean to Connecticut. Little did he know he would come to call this place home. 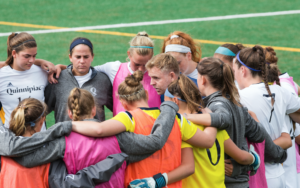 At CCSU, Coxon played three years, graduating with a degree in sociology and coincidentally met his future coaching partner and lifelong friend, Quinnipiac women’s soccer head coach Dave Clarke. Even back then, the two found they had complementary personalities on and off the pitch. Clarke played left back and Coxon was spread on the same side at left mid and often times up front at attacker for CSCU. “My role at the time was to stop goals and give him the ball, and let him do all the running in front of me.” Clarke said. Now their roles are reversed, as Coxon supports Clarke on the sidelines. Clarke acknowledges how the differences between he and Coxon have made them even closer friends. By Coxon’s senior year and Clarke’s junior year, the two roomed together off campus. Although soon after Coxon finished his final season at CSCU, he went off on his own to pursue a professional career. He returned to England to have a chance at a professional career in the English Premier League. After that did not pan out, Coxon came back to Connecticut, and played in a pre-cursor league to the MLS, professionally for the Connecticut Wolves, until 1997. After that hiatus, Coxon reunited with Clarke at the University of New Haven on the women’s soccer team’s coaching staff. Stevie said he gave up his professional career because he became a father. Today, by attending a Quinnipiac women’s soccer game, you can see this duo is still thriving 29 years later. Coxon can be seen pacing along the sideline, emphatically cheering his players on, while Clarke remains arms-crossed, observing and calculating. Coxon and Clarke find a sort of equilibrium with each other that is rare to find in coaching. As the 2017 season continues on for the Bobcats, Clarke and Coxon look to keep the team striding up in the ranks. The team recently matched up against the Quinnipiac’s first ever ACC opponent in the Miami Hurricanes on Sept. 3. Even though the Bobcats fell to Miami 3-1, Coxon had no doubts in the team’s capabilities. Going forward, Coxon will continue to pursue all his Connecticut Football Club duties as co-founder whilst focusing his energies on Quinnipiac. Coxon’s CFC organization is currently building a new indoor complex in Bethany, Connecticut which will span 60,000 square feet. As for the future, Coxon said his goal is to own a successful professional team. This year marks the 30th year Coxon has been involved in various aspects in the Connecticut soccer community. Perhaps one day he will be inducted into the Quinnipiac Hall of Fame as well.